Remember what it was like to be a kid? Sometimes we think back and feel like those days were so easy and carefree. But we can easily forget that young people have plenty of worries and fears that can put stress on little minds and growing bodies. That's why Bach Flower Essences created Kids Rescue Remedy. It's an all-natural, alcohol-free formula that supports stress relief in children. It could help lessen feelings of anxiety, frustration and even shyness. Parents find their children respond quickly and positively to this kid-friendly formula. Kids who can't stop screaming may calm down. Kids who deal with irrational fear and extreme shyness may gain courage. Angry, impatient children may find it easier to keep a level head and control their emotions. 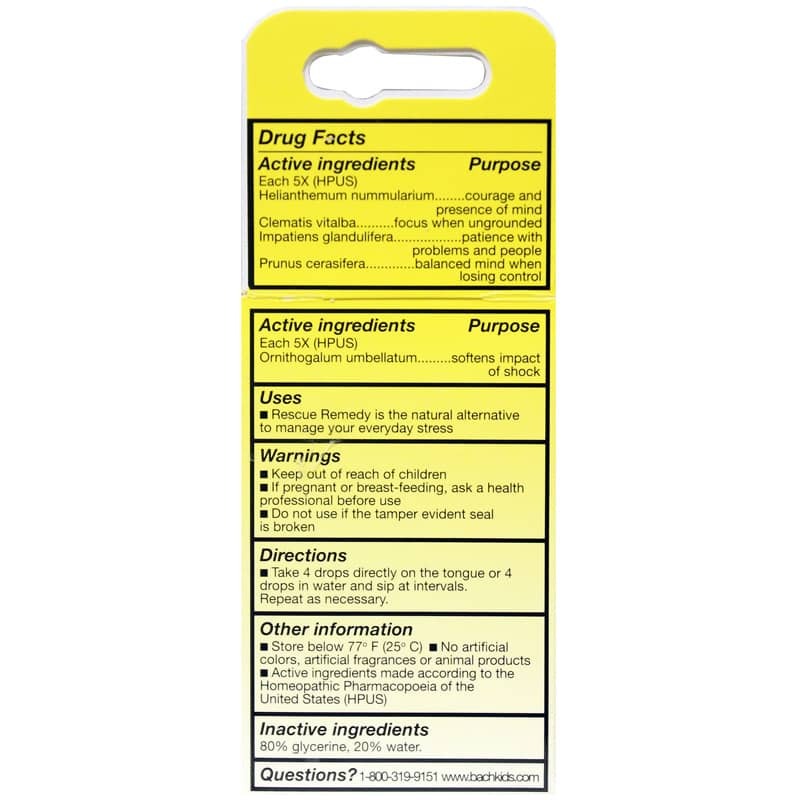 Kids Rescue Remedy is used in 66 countries, and is non-habit forming. Help your child regain peace of mind with some natural support, and bring stress-free serenity to your home. Children often respond quickly to The Bach Flower Remedies. Parents giving The Bach Flower Remedies to their children are often amazed by the positive effect the Remedies have on their children; screaming children may find sudden relief, shy and fearful children may find courage, impatient and angry children may find peace. The Bach Flower Remedies are 100% safe and natural for children. 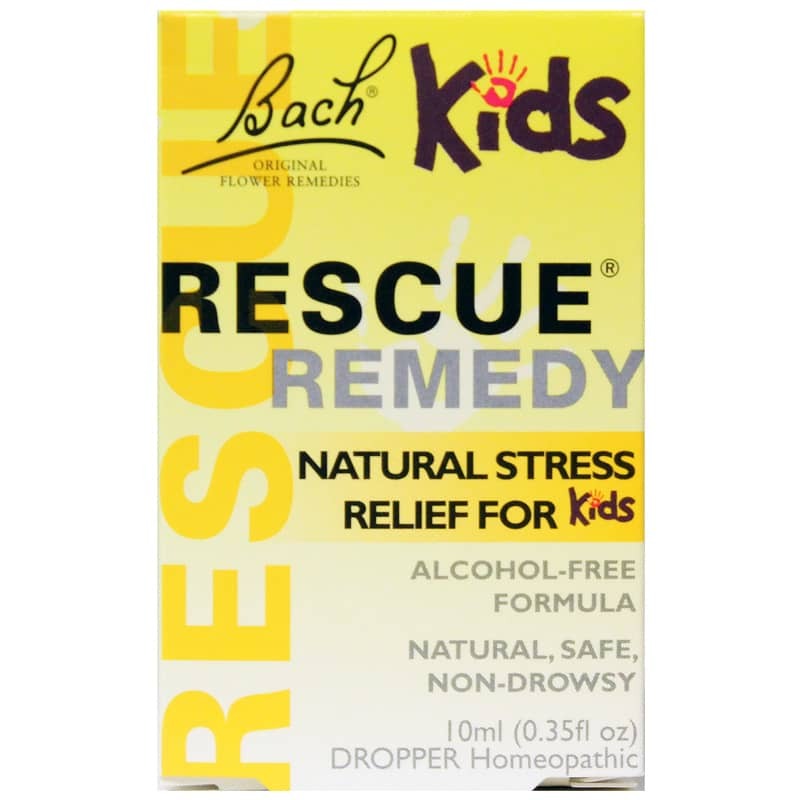 Created to positively support your childs emotions and restore balance, each remedy is part of a system of 38 Bach Flower Remedies developed by Dr. Edward Bach more than 70 years ago. Each kid-friendly remedy provides support for a specific emotional state and is safe, non-habit forming, and used in 66 countries worldwide. Other Ingredients: 80% glycerine, 20% water. Take 4 drops directly on the tongue or 4 drops in water and sip at intervals. Repeat as necessary. If you are pregnant or nursing, consult your healthcare practitioner before using this product. Keep out of the reach of children.